The top prospects – more than 70 of them – arrive in Florida on Friday for MLS’ annual combine that leads toward next Friday’s SuperDraft in Chicago. MNUFC took Abu Danladi (right) first in the 2017 SuperDraft. As part of it, the league has signed seven of the best prospects to its Generation adidas classification. It's a joint program between MLS and adidas in which the league signs several top collegiate underclassmen and select youth national team players to contracts and enters them in the SuperDraft with their salaries exempt from their new team’s salary cap. 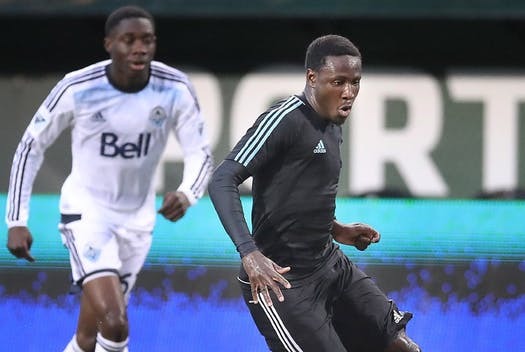 Minnesota United used that program to select UCLA forward Abu Danladi first overall in 2017 and Indiana University forward Mason Toye seventh overall in 2018. This time around, MLS has designated seven Generation adidas players, and it just so happens the Loons have that seventh pick. They are midfielders Siad Haji from Virginia Commonwealth, Frankie Amaya from UCLA, Tajon Buchanan from Syracuse, Griffin Dorsey from Indiana, forward JJ Williams from Kentucky, defender John Williams from North Carolina and goalkeeper Dayne St. Clair from Maryland. Amaya and Haji are projected as the top two candidates to be taken first overall by expansion team FC Cincinnati. Jamaican midfielder Peter-Lee Vassell, the 2019 Caribbean Combine MVP, also will participate in the combine as will University of Denver forward Andre Shinyashiki, whom the league has signed to a senior contract. Minnesota United is sending a delegation of 10-plus people to Orlando to observe matches, training sessions and small-sided games that start Saturday and go through Wednesday. The group includes sporting director Manny Lagos, coach Adrian Heath, player personnel director Amos Magee, assistant coaches, video personnel and athletic trainers. In addition to the seventh pick, the Loons also have the 31st pick in the four-round SuperDraft. All 24 MLS clubs and future expansion teams Nashville and Miami will attend. All four matches – two on Saturday, two on Wednesday – will be streamed live on www.MLSsoccer.com and MLS’s YouTube channel. Danladi scored eight goals while starting 15 of 27 games he played during his rookie 2017 MLS season, but was limited to 16 games (five starts) during his second season sidetracked by injury. Toye played in 17 games and started two during his first MLS season last season.